This is the final installment of a five part series for sales professionals who want to get the most out of HootSuite for social selling. To simplify your social selling workflow, download the new HootSuite guide, Social Selling Action Plan: Closing the Loop From Relationships to Revenue. Thanks to social media and online search engines, buyers have access to more information than ever before. But does that mean they are better informed? Not always. Even though they can retrieve basic facts about your company and your competitors with a quick search, they still need somebody to help them find the strategic insights that really matter. They require a trusted partner who will listen to them, understand their unique requirements, and then challenge them to see the world in a different way. In other words, an educator. In previous installments of this series, we have shown how HootSuite can help you listen to prospects and recognize when they need your help. When it is time to reach out, you should have useful, relevant, and engaging content at your fingertips. Good content provides a starting point for future sales conversations and helps you set the strategic direction of your relationship. When communicating with individual prospects, it is important to utilize the best content for the situation. Leverage material from your marketing department and independent sources that is crafted for people in their role and industry. Do not add to their information overload—help them cut through it. With the Dropbox App, available now in the HootSuite App Directory, you can easily access your Dropbox pictures, videos or files, and then share them with your prospects through social media. The app will create a direct share link for your prospect, shorten it to an ow.ly link, and automatically include it in your social message. If you try to share a private Dropbox file, the app will prompt you for confirmation. Whether you are using official marketing content or your own material, the Dropbox App allows you to keep everything organized and accessible. You can use the app to upload files to Dropbox from your computer, or even from other file sharing services including Box, SkyDrive, Google Drive and more. Organize your content into folders that match your sales process and buyer personas, so you can seamlessly share the right file at the right time. If you store your content on Google Drive, check out the Google Drive App in the HootSuite App Directory. 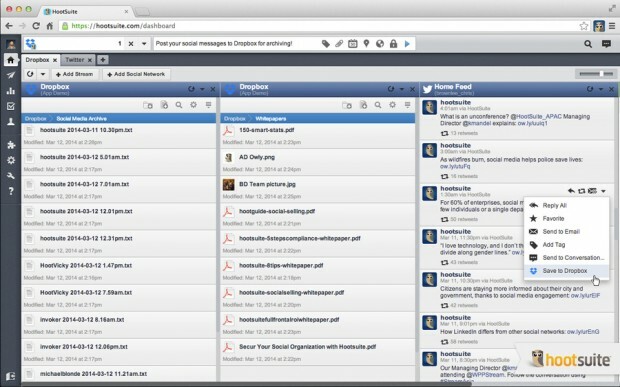 Like the Dropbox App, it allows you to view and access your files from within the HootSuite dashboard, then share them directly from your social media accounts. If you accidentally try to share a private file, the app will prompt you to manually confirm the share. After your prospects read the content you provide them, you have a timely opportunity to follow up and ask them what they thought of it. Strike while the iron is hot. You want to engage them in conversation when the strategies and ideas you have presented are still fresh in their minds, not weeks later. Therefore, it is crucial to know if and when your prospects have actually clicked on the links in your social messages. When you share content with your prospects through a private message, @reply, or even email, use a link shortener such as ow.ly to make your links trackable. A quick look at the ow.ly click stats will tell you whether your prospect has viewed the content, so you can follow up with them to talk about it.